Here's a disclaimer: I am not a cake decorator. My mom is a cake decorator. She supplies the whole family with cakes for every occasion, so there really has been little need for me to hone my cake decorating skills. When I was given the opportunity to check out some new cake decorating kits by DeAgostini, I realized I would probably not be their most talented customer when it came to decorating. I have, however, made more than my share of cakes, so I felt a bit qualified to offer an opinion from that perspective. My first two kits arrived together in a box with a binder for all current and future guides. 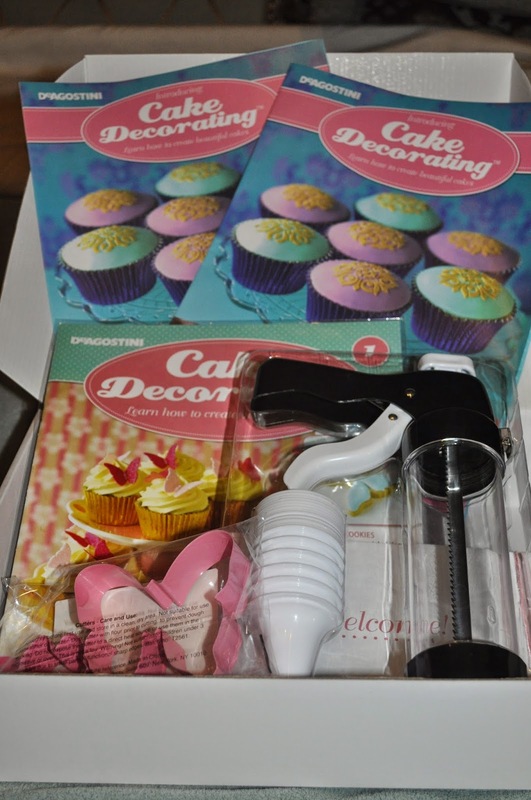 Also, in the box for the first kit was a cookie press gun set with interchangeable tips, two butterfly cookie cutters in different sizes, a checkered cardboard cupcake stand, and the first guide. Actually, I believe the binder accompanies the second kit, but since I had it I decided to go ahead and put the guides into the binder and describe that process here. Each guide is divided into 6 sections: Mini Cakes, Essential Equipment, Classic Recipes, Special Occasions, Decorating Masterclass and Cakes for Kids. Recipes included and skills covered are also neatly outlined in the beginning of the guide. The first guide includes the following recipes: Sugar Cookies, Buttery Yellow Cake, White Chocolate Cupcakes, Royal Icing, and Classic Chocolate Cake. See the little white plastic pins in the center of the divider. Each one pops out and gets inserted into holes at the top and bottom of the binder. The pins are what hold the issues in the binder. My first challenge was figuring out how to put volume 1 into the binder. After puzzling for several long minutes as to how on earth the thing worked and asking my family for suggestions, I realized the directions were included in the box. Duh! I hope other customers are more observant than I. In my defense, the binder is not a simple three-ring binder. There is some rigging involved. Once I had the binder sorted out, I looked through the first issue. It began with a lesson on frosted sugar cookies using the large butterfly cookie cutter. Three icing techniques are covered in this section: outlining, flooding and dotting. The cookies looked beautiful and I may put these lessons to use at another time. Since we are getting ready for all things fall right now and since I live in a family full of males, I decided to forego the butterfly cookies and move on to the other sections. The next section, Essential Equipment, focused on the pros and cons of different kinds of cookie cutters and the ways in which they can be used. It did not, however, mention the cookie press gun, which surprised me. Section 3, Classic Recipes, was devoted to baking a buttery yellow cake, along with a recipe and tips and techniques. I decided this might be a good section for me to try out. The recipe promised to be simple, foolproof and moist, so I gathered my ingredients and equipment and set out to make the perfect moist yellow cake. One thing i noticed about the recipe right off the bat was that there was no flavoring of any kind in the cake. I have never made a cake without the addition of some type of flavoring so I decided to make that change to the recipe. The cake pictured in the guide was topped with whipped cream and raspberries and had a layer of raspberry filling between the layers, but the guide also offered alternatives to these. Since peaches are in season right now, I decided to top my cake with peaches and fill between the layers with peach preserves. Also, because I like the flavors of peaches and almonds, I decided to flavor my batter with almond flavoring and to add a splash of amaretto to my whipping cream. The directions said to use two (8 inch) springform pans and to line them with parchment paper. Already I was questioning the simplicity of this recipe, because lining springform pans with parchment is not as simple as it sounds. I wondered why I wasn't just using round cake pans and greasing and flouring them, but I soldiered on, doing as I was instructed. So much for simplicity. The recipe also suggested adding up to 2T of milk if the batter looked dry. My batter did not look dry at all, but I added 1T of milk just in case. When my cakes were done baking and had cooled enough to remove them from the springform pans, I finished them off with the peaches and cream and served myself up a slice. The cake looked good, but when I cut into it, I knew something was wrong. My cake was dry...very dry. I have a convection oven, which I have used to bake many cakes that have turned out moist and delicious, so I am not sure if that played a part in this dry cake, but clearly something went wrong. Ok, so much for foolproof and moist. The flavors were good, but in order to make the cake edible, I would have to add a juicy topping of muddled peaches to soak into the dry cake, similar to strawberries served over shortbread. I decided it was time to move on to another section. Section 4 of the guide was devoted to making cupcakes with little fondant butterflies using the small butterfly cookie cutter. It included recipes for white chocolate cupcakes and buttercream icing, as well as tips for presentation and packaging. The Decorating Masterclass section was a lesson in icing, the kinds of icing and how to use them. Six different icings, glacé, royal, fondant, fondant icing, gum paste and buttercream, were described. A recipe for royal icing and the different consistencies and uses of royal icing was included. The final section, Cakes for Kids, described how to make a Fun Circles Cake, using fondant. I am not a fan of fondant, but it does make pretty cakes. The Fun Circles Cake was smooth and colorful. This section also offered variations on the Fun Circles Cake using M&M like candies or white chocolate buttons. I would be interested in how to get results like this using buttercream instead of fondant. All in all, this kit covered several basic techniques for decorating cakes, cookies and cupcakes. Next week, I will tell you about the goodies in kit number two.